Facial moisturizer is one of those products women use every day, but maybe don’t think too much about. It’s easy to just assume that the “good stuff” is really pricey and out of reach. Take a look at the list below to see just how many high-quality, organic face moisturizers are available. Some have been formulated for women with normal skin, while others meet the needs of women with dry, oily, or mature skin. 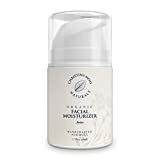 These moisturizers include natural oils, vitamins and minerals, and proprietary blends of botanicals that replenish moisture, renew elasticity, and contribute to a glowing complexion. High quality skin care treatments really are within reach for every woman. Pampering yourself every day with exclusive formulas can make you feel good as well as look good. With a brand tag line that’s “Food for Healthy Skin”, it’s no wonder that this face cream’s main ingredients include Moroccan Argan oil. This powerful, natural oil is known for providing skin-friendly nutrients that support better texture and tone. Aloe helps hydrate skin. Shea butter lends itself to better elasticity while protecting skin and minimizing the look of imperfections like fine lines. This USDA-certified organic face cream is GMO-free, vegan, fair-trade crafted, and made in the USA. This product is not tested on animals. Women with skin that’s normal to dry will find the best results using this product. This light, non-greasy yet hard-working moisturizer helps reveal smoother, glowing skin. Aloe, cocoa butter, and shea butter ensure intense hydration. 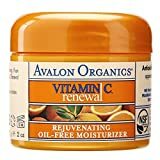 Vitamin C fights free radicals and environmental damage from ordinary causes like the UV light women are exposed to every day. Active ingredients include lemon bioflavonids and white tea, which also help support cell renewal. Regular use may help minimize fine lines, dark spots, and other imperfections, while improving skin’s firmness. Women with all skin types can use this product, which is vegetarian, and not tested on animals. Women with dry and mature skin have special needs; they want a moisturizer that’s effective without being so heavy it blocks their pores. SanRe Organic Skinfood Siesta Sunset’s provides remarkable hydration with gentle ingredients like avocado oil and sea-buckthorn oil. The formula is supplemented with organic beeswax and a blend of other oils (chamomile, fennel, hyssop, and rosemary) to ensure complete moisture, and it can be used daily. 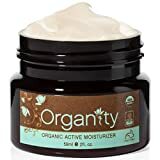 This moisturizer is certified organic, alcohol- and gluten-free; it’s non-GMO, and not tested on animals. This small pump holds a highly concentrated moisturizer that fulfills large promises! 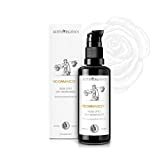 Its organic formula fights the signs of aging caused by free radicals, like fine lines and wrinkles, while improving skin’s texture and luminosity. Aloe vera is blended with natural oils (apricot, grape, and avocado) to help alleviate dryness. A key ingredient is star anise oil. It has great anti-aging properties; some mild licorice fragrance is normal upon application of the moisturizer, but it fades quickly. This product can be used by women and men with all skin types. It does not clog pores. The hypoallergenic, BPA- and GMO-free, certified organic, and vegan product is not tested on animals. This vitamin-rich face cream doesn’t mess around. It minimizes several common signs of aging, like feathery lines and dark spots by encouraging cell turnover. Hibiscus and Neroli oil improve skin’s elasticity naturally, and dry skin is relieved by French-sourced Helichrysum. Vitamins A,D, E, and K, plus B and B6, “feed” skin so that it can better make the fatty acids essential for making collagen. And anti-inflammatory hibiscus and green tea soothe acne-prone skin. 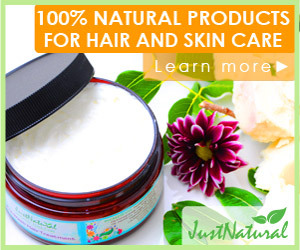 This product is made with organic ingredients can be used by women with all skin types, and is never tested on animals. This product boosts skin’s ability to build collagen, and it increases and maintains hydration for softness while reducing the look of fine lines and wrinkles. The aloe-based formula is loaded with antioxidant vitamins like A, B6 and B12, C and E that the skin absorbs quickly and easily. Chamomilla Recutita helps ease redness and inflammation. All-natural beeswax and carnauba wax seal in moisture. Women with all skin types, from sensitive to oily, can use this product; it’s made without harsh chemicals, like parabens, BHA, phthalates, or synthetic dyes or fragrances. Look younger and rejuvenated with this creamy moisturizer, suitable for every day use. A key ingredient is Bulgarian Plant Rose oil, which is distilled through a process that’s unique to Alateya, who grows its own roses. Using this moisturizer combats the free radicals that contribute to aging, and helps boost collagen. It’s very lightly scented, and that scent dissipates quickly. This lotion absorbs greaselessly, with a light and fluid texture that’s appropriate for all skin types. This product is great for everyday hydration. It’s certified organic, and made without GMO ingredients, synthetic fragrances, preservatives, or parabens. Rose oil is a key ingredient. It calms and soothes skin with light, natural rose fragrance. The glass jar protects the moisturizer from outside light, odors, other contaminants. It absorbs quickly, and is comfortable for all skin types. Simplicity is key here. This Brooklyn-based company’s certified organic moisturizer has only three ingredients: shea butter, coconut oil, and olive oil. It’s good for all skin types but especially dry skin. The consistency is rich and creamy, leaving skin thoroughly hydrated, and moisture is locked in. A little goes a long way in relieving very dry skin. Good for face and body, and can be used anytime. A concentrated oil-based formula goes to work on skin while you sleep. Just one or two pumps of this certified organic serum is enough; skin absorbs it quickly. Evening primrose oil provides powerful hydration. Vitamins and minerals give skin the building blocks it needs, while linoleic acid promotes elasticity. Women with dry skin and normal skin may see benefit. This formula has no artificial fragrances, petrochemicals, or preservatives, plus, it’s GMO- and cruelty-free. 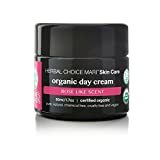 Most women can’t afford to spend big bucks on fancy skin care treatments like an organic face moisturizer; however, there are lots of choices that come in at less than $35 that provide real results through pure and natural ingredients. 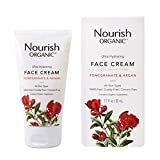 These organic lotions, serums, and creams can moisturize skin thoroughly, while also providing additional benefits like cell renewal, greater tone and elasticity, and fewer fine lines and wrinkles. The makers of these skin care products are well-known companies that take pride in their work. They offer consumers lotions, creams, and serums made with the highest quality, proprietary components, at a price that’s fair and affordable. This means it is easier for every woman to feel beautiful, every day.